Abbotsford – The Abbotsford Police Department Drug Enforcement Unit continues to target and disrupt groups involved in the Lower Mainland Gang Conflict, and has specifically targeted those dealing in fentanyl and carfentanil. 19 year old Sukhjit Mahli, remains in custody, charged with breaching his current court order and possession for the purpose of trafficking fentanyl. 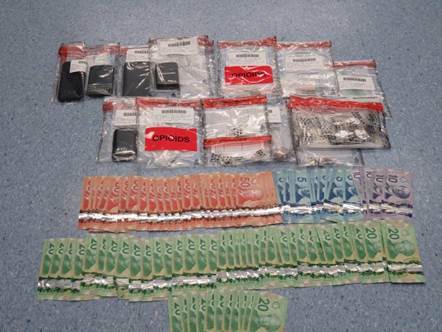 During the course of this investigation, cocaine, fentanyl, cellular phones, $2500 cash and two vehicles were seized. The two vehicles will be considered for Civil Forfeiture. At the time of his arrest, Sukhjit Malhi was on bail for charges including drug trafficking in fentanyl, cocaine, heroin and methamphetamine, possession for the purpose of trafficking, and firearms-related offences related to a previous APD investigation. Contact the Abbotsford Police Department Gang Crime Unit for information on the warning signs of gang involvement, risk factors, and for help getting yourself or someone you care about out of the gang life. Contact us at helpyouth@abbypd.ca or call 604-864- 4777. Be the first to comment on "Abby Police – More Charges For 19 Year Old Lower Mainland Gang Conflict Associate"